Some interesting modifications made to what appears to be a 1913 tourer. Earlier windscreen fitted, later louvred hood, later front fenders. I doubt it is the original black also. One thing about a '13,.....you can always tell a '13, even at a glance. That's the only year Model "T" that had doors quite like that! Wish we knew how old that car was at the time of the picture...it amazes me how many of these old photos show such ratty looking cars. The paint must not have held up well at all. Many cars got repaired from a minor wreck with what would fit at the wrecking yard. What is unusual to me about this picture is the upholstered door caps. Canada didn't do that did they? This photo has been shown before at some time. It is a New Zealand picture. The native flax woven picnic basket gives a very good clue. 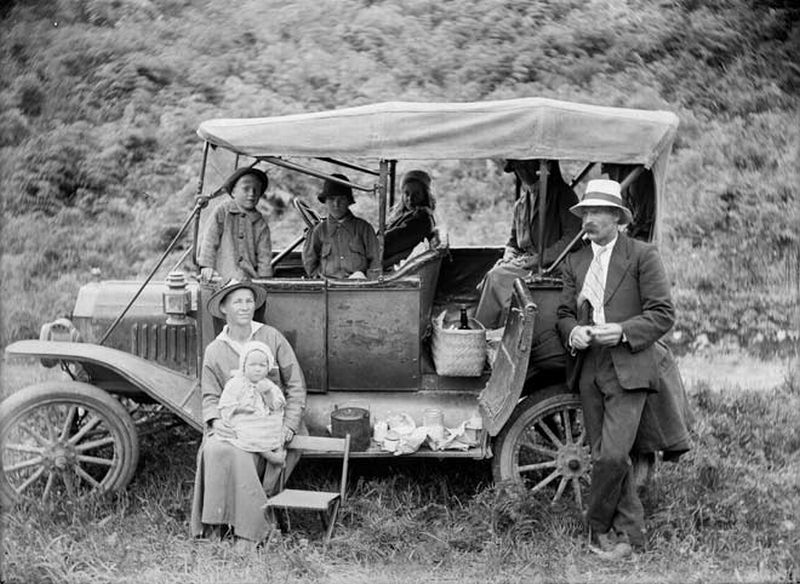 I think it shows up on the Alexander Turnbull library list of photos, a huge inventory of historic photos here in NZ. It would certainly be a 1913 going by the doors, but there were imports of 1913 examples into NZ from the USA before Canada began production, so it is anybody's guess as to the truth of it all. Seems to have a double wishbone on the front axle.